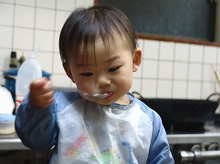 Recently my son, Yuuki became to be able to eat with spoon or fork by himself. Of course he usually use his hands to eat, and he can eat any foods we prepare. Today, as he was hungry he ate a lot. One of today’s dinner was salad of tomato and cucumber with vinegar and soy souce. He can eat Umeboshi (Japanese dried plum with salt), so he likes and eats sour food or vinegar. And he can express that he feels sour taste…….. This entry was posted in Family on 2006年2月20日 by izusakuraya.